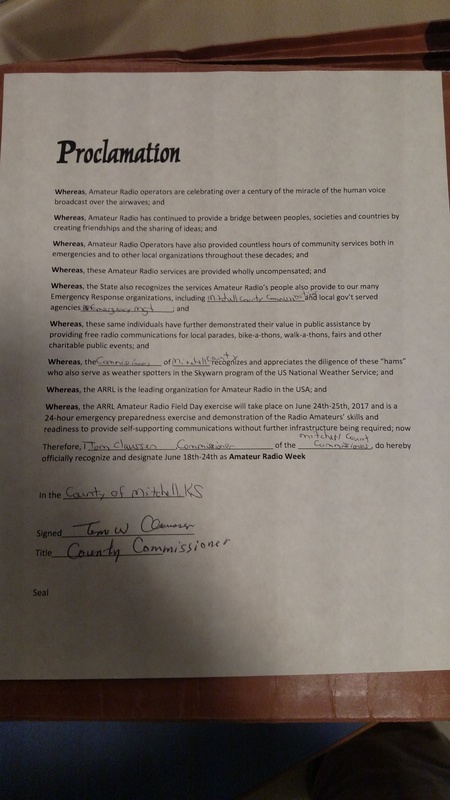 The Mitchell County Commissioners in Beloit, KS, have unanimously declared the Week of June 18th to June 24th, 2017, as Amateur Radio Week in Mitchell County. Commissioner Claussen expressed how impressed he was with the Kansas-Nebraska Radio Club Field Day set-up at Field Day last year. He stated that he is planning to visit this years Field Day at the Mitchell County Fairgrounds in Beloit, KS, on June 24th. As part of the declaration, the Commissioners signed a proclamation in support of Amateur Radio Week. The Kansas-Nebraska Radio Club will be setup at the Mitchell County Fairgrounds in Beloit, KS, at the Barstow Building. Setup will begin at 10am on June 24th with tear-down on June 25th at 10am. Field Day is open to the public and we invite everyone to stop by, look around, and ask questions. On June 25, 2016, members of the Kansas-Nebraska Radio Club Participated in the ARRL Field Day 2016 at the picturesque Bohemian Hall, South of Glasco, KS. Although the day started out partly cloudy and breeze, the evening house brought much needed rain to the area but the thunderstorms forced an early end to the day. Band conditions were limited to mainly 20 and 40 meters with a few contacts coming from 15 meters. Fifteen meters produced the longest distance contact from Puerto Rico. Our Field Day site had a few visitors including: Tom Claussen (Mitchell County Commissioner), Terrence Stewart (Riley County Police Citizens Advisory Member), David Dohe (Lincoln County Emergency Manager), and Rand Longino (Red Cross at Barnard, KS). A big thank you to all who helped with Field Day and came out to join us. A special thank you goes to the Bohemian Hall for letting us use their grounds and building for Field Day! Now it’s time to plan for NEXT YEAR! We hope you can join us then.